Defender Johan Djourou has revealed becoming a father has changed him as a player. Djourou's daughter Lou was born 14 months ago when he was spending time out of the game with injury. The Swiss international believes the change in his personal life has focused him on making his career as productive as possible. "Personally, the birth of Lou has made stronger and has motivated me favourably. Before I only played for myself and to make my family and friends proud. "Nowadays there is someone who depends on me. I play for Lou, I fight for her to give her the best future she can possibly have. That changed me psychologically." The 23-year-old, who is in seventh season with Arsenal, is arguably one of the standout performers in Arsene Wenger's side this term. In an interview with Swiss daily Le Matin, the defender said he believes his injury troubles which kept him out of the game for more than a year have allowed him to return to the game even stronger. "Yes, it matured me. More than ever before, it got conscious how lucky I am that I can do this profession. "I had such a desire to come back, such a desire to play football. Always watching my teammates play, I needed some nerves. "But I think because i was forced to observe the matches, I believe I have also progressed tactically." 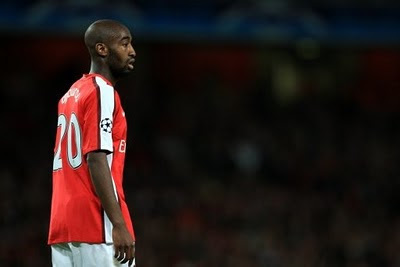 Djourou's record in the Premier League is a clear sign of that improvement. With him in the team Arsenal have avoided defeat in all of his nine appearances.